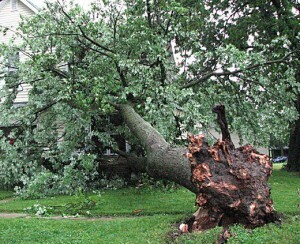 Last night’s powerful storm system that passed through DuPage County took many of us by surprise. I knew the forecast was calling for rain and potential thunderstorms, but there did not seem to be any major threat. My first real clue that the impending storm system was of a more ominous nature was the screaming storm sirens down the street. At the sound of the sirens, I quickly scrambled the kids down to the crawlspace. There, for the next hour or so, we hunkered-down armed with flashlights, a storm radio, and juice boxes. We listened to the weather reports on the radio, informing us that the sever thunderstorm warnings had all been upgraded to tornado warnings. Thankfully, the storm passed through with no major damage in our immediate area. This morning, it was clear that other areas in and around DuPage County had experienced some fairly severe tree damage and power-outages. The power in Winfield went out at 8:30PM and was still out this morning. In fact, area power-outages have left nearly 270,000 ComEd customers without power. With no power, many traffic lights have been reduced to four-way stop intersections, causing major traffic delays throughout the area. Thankfully, there were no reported tornadoes that touched-down in our area last night; the damage could have been far worse. In comparison to the recent tornado that ripped through Joplin, Missouri, our storm woes today are mere inconvenience. Still, with the potential for severe thunderstorms and tornado producing systems to form throughout the summer, it’s a good idea to review storm safety and preparedness. The major safety threats that severe storms of this nature crate include: lightning, wind (including tornadoes), and flooding. If you can hear thunder, you are usually within range of a potential lightning strike. You are best off seeking shelter indoors when the threat of a lightning strike is present. If you are stuck outside when there is a threat of lightning, DO NOT SEEK SHELTER UNDER A TREE! Go to the lowest point in the surrounding area stay close to the ground. Lightning almost always strikes the highest point in the nearby landscape. Seek shelter right away, don’t wait! Go to the lowest interior room within a nearby building (basements and crawlspaces are best). If you do not have a basement or crawlspace, go to an interior room or bathroom with no windows. Avoid exterior walls and corners where two walls meet. Keep your head covered if you can. Tornados can turn almost anything into a potentially deadly missile. Never open your windows. If you cannot find shelter in a nearby structure, go to the lowest point you can find in the surrounding landscape (a ditch or culvert is best). Cover your head with your arms to protect yourself from flying debris. Never seek shelter in a car as a tornado can easily pick up the vehicle. Never seek shelter under an overpass or bridge as tornado winds can be even more concentrated in these areas. Strong rains can bring about flooding in low-lying areas and around nearby river, streams, and creeks. Water run-off in flash flood situations is almost always stronger than it appears; never attempt to enter or cross a roadway or bridge that is flooded or has been overtaken by flowing water. Best advice for flooding is to avoid flooded areas altogether. Be safe and prepared this summer. Keep a weather radio and flashlights ready and on hand. Be sure to discuss storm safety with your children so they know what measures to take should the weather take a turn for the worse.